IAME/Parilla Nor Swift Cadetti/Mini Nå i ny utgave med forbedret startapparat. Ny enhetsmotor for klassene Cadetti og Mini for de neste 10 årene. Motoren kommer med Eksosanlegg, alle tenningsdeler en trenger, forgasser og Lydboks. Motoren er lik for Cadetti og Mini, bortsett fra forgasser og eksosflens. 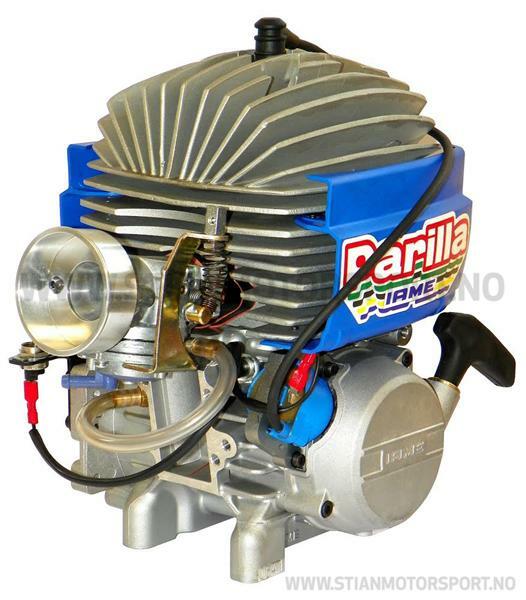 Since its birth, the imprint that Bruno Grana, the historical founder, wanted to give to IAME's DNA, was the production of high quality, long lifetime, affordable and manageable engines. This Mission is today carried on with the same passion and dedication of the past, constantly keeping direct control on the projects, the productive processes and the sales. IAME is dynamic and flexible: primary characteristics for a Company wishing to give a careful service and a constant up to date product. In IAME history meets technology. All the experience achieved in more than 50 years of production is wisely managed by advanced and last generation machineries. Every unit is managed through sophisticated computers: since the idea of the engine in the designers' mind, to its delivery throughout the world. Technical unit, Research & Development, Quality Control, Production, Race Department, Logistic, all the production units are in constant interaction and, together with the most qualified technicians, and three-dimensional software and structural calculation, inertial test benches, CNC lathes, endoscopies, durometers, microscopes up to 1000 magnifications, they give life to the IAME engines: Parilla, Komet, BM and Sirio, products of unquestioned Made In Italy quality.